Life @ SoM: IQuiz - Resounding success yet again!!!! IQuiz - Resounding success yet again!!!! 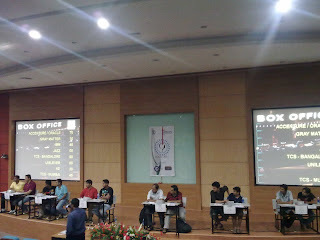 IQuiz 2011, the flagship event by MARKTRIX - marketing club of SJMSOM, was successfully conducted in association with Mahindra Scorpio. Huge participation was received from B-schools as well as corporate teams. Teams flew in from Bangalore, Chennai, Delhi and other cities for this mega challenge. The event saw participation from major B-schools across India such as IIM C, FMS, SPJAIN, NITIE and corporates such as Unilever, TCS, Accenture, Oracle, IBM and so on. The pre-event ‘Amber Room’ turned out to be a roaring success and the top 5 winners got a direct wild card entry to the on-campus preliminary round of IQuiz. Participation was received from over 530 teams who were engaged in an intellectual battle over 3 days. This pre-event set the mood of the IQuiz. “Scorpio marketing challenge”, the other pre-event which gave winners an opportunity to take part in Mahindra's "Great Escape", saw innovative entries from participants making jingles, coffee table books, write ups and taglines for Mahindra Scorpio. Despite the rain god showering his blessings in the form of incessant rain, IQuiz event started off on Sunday attracting a fairly large crowd. The preliminary IQuiz challenge started in the morning with a written round containing 30 questions having a time limit of 1:15 minutes for each question. Conducted in the state of the art VMCC Main Auditorium, the atmosphere was full of excitement with each participant eagerly awaiting the written round. The whole mood was joyous and exhilarating in the campus. The main IQuiz challenge, hosted by Mr.Andrew Scolt, VP, Derek o'Brien Associates, saw 8 teams - 5 from corporates and 3 from B-Schools battling it out for the coveted prize. Enthusiasm was in full swing among the competitive audience, with everyone vying to win on the spot prizes - headphones, fast track watches, sun glasses and t shirts. The finals proved out to be a close challenge, with TCS Bangalore emerging as the winners taking away cash prize of Rs.60000, followed by runners up Accenture wining a cash prize of Rs.25000. A special prize of Rs.10000 was given to NMIMS, the highest scoring B-School team in the event. The chief guest of the day - Mr. Arun Malhotra, Senior VP, Sales & Channel Development, Mahindra & Mahindra, gave away the prizes to the winners. Displaying his quizzing talent groomed at IIM C, Mr. Arun Malhotra held audience onto their seats by posing challenging questions making them think hard to win on the spot prizes. In all, IQuiz 2011 surpassed all the benchmarks set by its precedent version. This is the proper weblog. it's miles very exciting blog ever. thanks for giving this sort of exceptional article. this is a nice article.Thanks for sharing such a good article.